Cover of the first volume of Idaten Jump featuring Sho Yamato. Idaten Jump (Japanese: IDATEN翔 / 韋駄天翔, Hepburn: Idaten Shō) is a Japanese manga series created by Toshihiro Fujiwara. It was serialized in Kodansha's Comic BomBom. The manga tells the story about a boy named Sho Yamato who loves mountain biking. It was adapted into a 52-episode anime series, produced by Aniplex, Production I.G. and Trans Arts. It aired from October 1, 2005 to September 30, 2006. A toyline was also made by Tomy. Sho Yamato is a boy who enjoys MTB (short for "mountain biking") a whole lot. 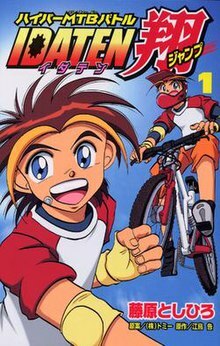 He's always practiced at the "X-Zone" (a place which his dad Takeshi made for MTB) with his friends Kakeru and Makoto while riding on a bike his dad has built called "Flame Kaiser". One day, he was challenged to a race by a MTB team called Team Shark Tooth and whoever won the race will get the X-Zone. For Sho, the X-Zone had always been a place of happy memories. He had spent many days there with his father who had disappeared, so he could not lose the game. During the race with Team Shark Tooth's leader Gabu Samejima, black smoke suddenly covered the ground around them, and they were sent to another world that's also called the "X-Zone." When Sho woke up, he found Kakeru, Makoto, and his MTB Flame Kaiser were also there. Of course, they did not know where they were. While they were wondering what had happened, MTB riders came. They challenged Sho to an Idaten battle, a form of MTB race in the X-Zone. They said the only way for Sho to return is by collecting 10 gold emblems by winning Idaten battles with their emblems while making their way to X-City which is at the epicenter of the X-Zone. This is how Sho came down to compete in Idaten Battles at various courses such as ghost towns, volcanoes, ancient ruins, deserts, and snow-topped mountains. Now Sho must Idaten Battle for the sake of returning home. Before an Idaten Battle begins, the MTB riders would put on their bike helmets while quoting "Ready, set, and go." When their bike helmets are on, a full mountain biking suit appears on them during the Idaten Battles. Sho's group decide to go to the X-City, the main city of X-Zone so that they can get the 10 gold emblem and can return to their home. They also face off against Team Shark Tooth and their various allies even when he arrives in X-City where Gabu Samejima is their dictator. After entering X-city they defeat Gabu the black smoke takes them back to earth. But Makoto' s brother remains there. They find that only a half day has goneafter staying 3 months in X-Zone. After returning home, Sho returned to X-Zone to find his lost father Takeshi while taking on the mysterious Team X. The main protagonist of the story. He is an excellent MTB rider and can do amazing tricks. He later defeats Gabu for the control of X City with the assistance of Makoto, Kyoichi, Arthur and Koei. After defeating his father who was under the control of an ancient evil, Sho chose to leave behind his friends to stay in X-Zone. But with the help of Hosuke, Sho was able to travel freely between Earth and X-Zone and reunite with his friends in the X-Zone MTB course. His MTB is Flame Kaiser. She is a girl MTB rider, the sister of Kyoichi Shido, and is Sho's childhood friend. She later realizes that her MTB is a legendary Idaten Bike called Neptune Emperor (Neptune in the english anime). During her time in the X-Zone, she discovered that the mysterious MTB rider that has been helping Sho's group was her brother Kyoichi. She is a caring sister. Kakeru is a very skilled mechanic and helps Sho fix his bike a lot. He is also one of Sho's best friends. A talking owl that accompanies Sho on his journeys. Hosuke followed Sho during a prison break attempt to rescue Sho, Makoto, and Kakeru. After Sho had defeated his father, it was revealed that Hosuke is Yuki's grandfather disguised as an owl. After his friend Takeshi had been transported to Earth, Hosuke became the King of the X-Zone. However, time moves much faster in X-Zone than it is on Earth, so Hosuke became an old man when Takeshi finally returned to X-Zone. Plotting to stop the ancient evil, Hosuke secretly became the talking owl, but without the memory of his former identity until he returned to his human form. In the end, Hosuke managed to help Sho get to Earth. Makoto's cute and handsome older brother and a trial bike champion. He appeared in masked form in early episodes up to episode 5 when his identity was revealed. He was captured by Mr. Teacher when trying to find out more about Team ST. He later helps Sho to fight Gabu. When it came to Team X, he ended up under the control of them and is trying to fight the Dark Emblem's control. Sho managed to defeat him (kyoichi helped him when he became normal for a short time before the race). His MTB is Thunder Emperor (Thunder King in the English anime), but rode Imperial Tiger when under the control of Team X.He always talks to sho negatively but cares about him. He owned a gold emblem. An expert mechanic. She helps Sho and Co. on different occasions. After Gabu's defeat, it was revealed that Yuki is a princess of a royal family with Hosuke (the real king) being her grandfather. Also, Yuki is part of a group who protects the X-Zone and the secrets of the X-Zone. A ninja biker hired by Gabu. He first appeared to take on Sho and Kyoichi. He injured Kyoichi, broke his MTB Thunder King, and took out the Four Kings that were battling Makoto. When he battled Sho, it ended up a draw when the Four Kings interfered. He thwarted another plot by the Four Kings when they tried to "assist" him when he thought of it as dishonorable. In his battle against Arthur, the Four Kings successfully interfered causing Arthur to lose. It is later revealed that Koei works for Gabu because he couldn't afford a doctor for his sister Kiku. Once she was rescued from Gabu's clutches, Sho and Koei battled again and he lost. Afterwards, he stopped serving Gabu and aided Sho in defeating him as he took out the adult members of Team ST. Later, he ends up under the control of Team X and was freed by Sho. He has Taiga watch over X-City while he is away. His Idaten Bike is called Aero Scissors. Nicknamed "The Painter," Arthur is an X-Tower knight bike rider. He first appeared in Gabu's tournament where he beats Taiga. Prior to his battle against Koei, he stumbled onto a plot by the Four Kings only for them to be thwarted by Koei. In Gabu's tournament, he lost to Koei due to interference by the Four Kings. It is later revealed that he worked alongside Yuki to help protect the secrets of the X-Tower and heal the X-Zone. His Idaten Bike is called Hammer Head. Sho's younger brother. He later joins Sho in his search for their father. Ayumu was forbidden to ride on bike because he goes crazy whenever riding one. His bike is Imperial Dragon (インペリアルドラゴン). Ayumu also likes Kiku not only that Ayumu defeated a lot of MTB riders using Imperial Dragon and his explosive power. Sho Yamato's father. When he was falling during a bike accident, he was brought into the X-Zone to repair Imperial X during a power crisis. When he tried to return to his home world, he disappeared alongside Yuki's father and was never seen again. During his disappearance, he built Imperial Tiger, and Imperial Dragon while struggling against the power of Dark Emblem, and also seen by Kyoichi in hooded form. He was later revealed to be on Imperial Island as Team X leader where he was possessed by the Ancient Evil of the X-Zone. He ended up challenging Sho for the fate of both worlds. After Sho had defeated his father expelling the Ancient Evil out of him, it was revealed Takeshi was an X-Zone native that had been transported from Imperial Island to Earth. Then he subsequently started a family, built Flame Kaiser, and constructed the X-Zone MTB course before the accident. At the end of the series, he chose to stay in X-Zone to train Sho as the new guardian. Leader of the Shark Tooth MTB team. Upon his arrival in the X-Zone one year ago, he became the dictator of X-City after overthrowing its mayor. He was said to have lured many MTB Riders to his team. In "Revelations," it is revealed that although he is the leader of the Shark Tooth gang, he is actually the younger Samejima brother and that his team had actually arrived earlier. He was also in Kakeru's algebra class. He was defeated by Sho in X-City, but later returns to help fight Team X. His bike is called Bloody Fang (changed to Poison Fang in the English anime). The oldest Samejima brother and second-in-command of Shark Tooth. When confronted in the cave and defeated in an Idaten battle with Sho, he revealed that the Shark Tooth MTB team came to the X-Zone one year ago. In his brother's tournament, he lost to Arthur resulting in him being kicked out until Gabu's defeat. He was later reinstated following Gabu's defeat. When Team X later came to power, he became X-City's protector while Koei is away. Made up of Kiyoshi, Mitsuru, Sayji, and Mantaro, The Four Kings are four MTB Riders who are members of the Shark Tooth MTB team. Though they are unskilled riders, they are often a cause problems by interfering through their underhanded tricks. A ship captain who is a member of Team ST. He and his crewmen challenged Sho when Sho was on a ship to X-City. They did get away with some of Sho's Emblems at the cost of Captain Jackal's ship and handed them to Gabu and Taiga. He also helped the other adult members of Team ST into preventing Sho from reaching Gabu. Captain Jackal took part in this to make Sho pay for sinking his ship. He was defeated by Koei and arrested by the X-Zone Police Captain prior to the black smoke returning him to Earth. Two sisters who are resort tycoons and members of Team ST. They turned a local village into a slum when they used the villager's money to build their resorts in Gold Celebresort City and ended up making everything in their resorts expensive. While Yoko does the MTB battles, Rika uses parts of MTBs to build Yoko's MTB rider. They defeated the villagers to gain their money. When their men captured Yuki, Sho had to Idaten Battle Yoko for her freedom. Despite the difficulty on the sand dunes, Sho beat Yoko when her bike (which was overlaid with expensive jewels) fell apart. They reappeared to help the other adult members of Team ST into preventing Sho from reaching Gabu. They were defeated by Koei and arrested by the X-Zone Police Captain prior to the black smoke sending them to Earth. A teacher-themed biker in a school theme park and member of Team ST. He captured Kyoichi and Sho had to beat him in order to rescue him. He reappeared to help the other adult members of Team ST into preventing Sho from getting to Gabu. He was defeated by Koei and arrested by the X-Zone Police Captain prior to the black smoke returning him to Earth. Ruler of a kingdom in the middle of a lake. Despite being a member of Team ST, Prince Ryota isn't like the other members of that group. To get info on how to get to X-City, Makoto challenged him to an Idaten Battle. The reason why Ryota was winning is because his butler Sebastian has been secretly sabotaging the wooden bridges on the courses without the Prince knowing. Makoto managed to defeat Prince Ryota and gain the information on how to get to X-City. Sebastian is a butler who serves Prince Ryota. He had been secretly sabotaging the wooden bridges on the race course to help Prince Ryota win. Sho managed to expose his plans, yet Ryota forgave him. Two eyepatch-wearing members of Team ST. They sabotaged Sho's bike trailer and framed Makoto causing them to get into a fight. They challenged Sho to an Idaten Battle in the rain since they knew that they would have the advantage after stealing Flame Kaiser's pedal from the sabotage. When Sho and Flame Kaiser are sidelined, Makoto ended up defeating them realizing that her bike is a legendary Idaten Bike that specializes in water. They reappeared to help the other adult members of Team ST to prevent Sho from reaching Gabu. They were defeated by Koei and arrested by the X-Zone Police Captain prior to the black smoke returning them to Earth. Nicknamed "The Leopard," Jero worked for his father's mattress store in X-City until he joined Team Shark Tooth. When Gabu gave him an MTB that has a motor engine, he didn't use it until Gabu took control of the bike. After that and being defeated by Sho, he quit the Shark Tooth team. He later ended up under the control of Team X and Idaten Battled Sho on Earth and was defeated again. He was sucked back into the X-Zone for his failure. An MTB Rider who specializes in MTB Battles in dark places. In Gabu's tournament in X-City, Sho Idaten Battled him in the subway where he was defeated. He seems to be working for Gabu since he is seen helping the other adult members of Team ST into preventing Sho and Co. from getting to Gabu. He and the others end up fighting and defeated by Koei and are arrested by the X-Zone Police Captain prior to the black smoke returning him to Earth. A fisherman MTB Rider and his fellow villagers who ended up under the control of Team X. A disguised Kyoichi under the control of Team X had given orders to Masagi to capture Ayumu and defeat Sho. Ayumu was challenged to an Idaten Battle by him and fell into the fisherman's trap. Sho Idaten Battled him where Masagi anticipated that Sho would get caught in the high tide. Ayumu escaped and tried to help Sho before the high tide occurred. Once Masagi was defeated, the rest of the villagers were free from the Dark Emblem. A vampire-like MTB Rider under the control of Team X who resides in a haunted mansion. He was the one who infected Makoto, Kakeru, Ayumu, Hosuke, and many of the mansion's inhabitants with Dark Emblems that gave them zombie-like personalities. When Sho encountered him, he Idaten Battled Count Freddy in the mansion with the windows shut. Once he was defeated, the victims were freed. The male and female MTB Rider duo. They lost against Sho Yamato and Gabu Samejima in an Idaten Battle. The white-suited MTB riders that appear in large groups in Imperial Island. They serve as the foot soldiers to Team X. In the final battle with Team X, all of them were defeated by Ayumu. Masami is Sho and Ayumu's mother and the wife of Takeshi. His real name is unknown, but is referred to as "The Boss." He is an outlaw biker who challenged Sho immediately after Sho had entered X-Zone. After he was defeated, the biker help saved Sho and Hosuke from the local X-Zone Police. An unnamed police officer and Captain of the Northern Guard who arrests unsanctioned Idaten Battlers. He had arrested Sho, Makoto, and Kakero when they were thought to be with the Rogue MTB Boss. Kyoichi and the Rogue MTB Boss had to bust them out causing the Police Captain to lead his men to pursue Sho. Kyoichi had to buy Sho some time by sidelining the Police Captain's men during their pursuit of Sho in the forest. The X-Zone Police Captain and his men managed to catch up to Sho at the desert. Sho beat him in an Idaten Battle to prove that he is not associated with the Rogue MTB Boss. He reappeared to help protect the citizens of X-City from danger. The X-Zone Police Captain later ends up under the control of Team X and Idaten Battled Sho on Earth only to end up being defeated and freed from the Dark Emblem, then he was pulled back into the X-Zone. He later returns to help fight Team X when Sho is on Imperial Island. A cowboy biker. His winning secret is that he has a twin brother taking over the course in the middle of Idaten battle. He used that cheating move to defeat Sho, but Shin the Shadow was defeated by Kyoichi who exposed Shin's winning secret. A heavyset MTB Rider in a bear-skinned cape who is the leader of Team Bandits (チーム・バンディッツ). They uses traps to steal MTBs. Sho had to beat Terry the Megaton in order to get Flame Kaiser back. Once he was defeated, he and Team Bandits renounced their thieving ways. A professional MTB rider who owns a bike shop in Volcano Village. He owns the blueprints of Imperial X. Leader of the Poison Spider (毒グモ団) MTB Team. He accused Zentaro of giving him a rigged tire which injured one of his teammates and planned to take some of the bike parts in Zentaro's shop as a refund. Sho had to MTB Battle him in a volcano in order to prove Zentaro's innocence. Takuma lost to Sho when the volcano shook, but he was saved by Kyoichi. Leader of the Hyper Brain (ハイパーブレーン) MTB team. The mechanic of the Hyper Brain MTB team. The rider for the Hyper Brain MTB team. He once went up against Sho Yamato and lost to him. In Gabu's tournament in X-City, Tasuku lost to Kyoichi. Nicknamed "The Grim Reaper," he and his henchmen disguised themselves as girls to learn Sho's weaknesses from Hosuke. Sometimes, he ends up laughing which turns into a girl's laugh. He reappeared on TV where he and his minions were fighting Gen while being a victim of Team X. An unnamed native-like MTB Rider in a tiki mask. He and his team resided in a temple and used a mist that causes hallucinations on opposing teams. They used it to defeat Sho, but were defeated by Makoto who recently obtained Neptune Emperor. An MTB rider who lives in the snowy mountains with his daughter Rin. In Gabu's tournament in X-City, he lost to Taiga. He was eventually returned to Earth where he was seen fighting Ken and his minions on TV. Nicknamed "The Falcon," Go is an MTB Rider in a miner town who claimed that he beat Flame Kaiser. He claimed that to impress his younger sister Saya. After an accident years ago, he's been afraid to get on his bike. With Sho's help, he got back on and defeated two punks that were attacking their town. Joe and Reiu are the gatekeepers of the North Gate of X-City. Sho had to Idaten Battle them at dawn in order to get into X-City. Sho learned from their mother that Joe had a bump on his forehead during their Idaten Battle with Team Shark Tooth who defeated them. Sho eventually defeated them and went on to X-City. The unnamed mayor that ruled X-City before Gabu overthrew him. She serves as emcee of Gabu's tournament in X-City. A gypsy MTB Rider who can predict the future. In Gabu's tournament, Arthur Idaten Battled her and beat her when she dropped her crystal ball and tripped over it with her MTB at the starting line. She later crashes the battle against Arthur and Taiga and ended up being saved by Arthur when she fell off the ramp. Koei's younger sister. She falls ill in her first appearance and is later captured by Gabu causing Koei to end up doing whatever he wants in exchange that Kiku gets a doctor. Once she was freed, Koei and Sho continued to return to their battle. A boy who had lent his bike to Ayumu during the match between Sho Yamato and Jero in real world. Yuki's trusted MTB trainers who resided in the X-Zone. When Takeshi was in X-Zone, they were trained by him to be mechanics. They gave Sho's group an all-terrain bike trailer to use on their journey to Imperial Island. A microbial MTB rider and his germs that infected Makoto with bad fruit found in the Nameless Forest. Sho was shrunken down to size to face Germ Man. Once Sho won the Idaten Battle, Germ Man and his Germ Men were vanquished. 13. School Battle! Explosion, Idaten Cross! 学校バトル！炸裂、韋駄天クロス! Gakkou BATTLE! Sakuretsu, Idaten CROSS! 14. The Man Who Beat Flame Kaiser? フレイムカイザーを倒した男！？ FLAME KAISER o taosu otoko? 23. The Idaten Battle Tournament Begins! 韋駄天バトルトーナメント開幕！ Idaten BATTLE TOURNAMENT kaimaku! 29. Final Battle! Who Will Be The Victor? ファイナルバトル！優勝は誰の手に？ FINAL BATTLE! Yuushou wa dare no te ni? 34. To X Zone Again! 再びＸゾーンへ！ Matatabi X ZONE e! 36. Roar! Imperial Dragon!! 爆走！インペリアルDG！！ Baksou! IMPERIAL DG!! 38. Gabu's Allure, Flame Kaiser's In A Pinch! 牙舞の誘惑、フレイムカイザー大ピンチ！ Gabu no yuuwaku, FLAME KAISER dai pinch! 43. Sho VS. Shido! Battle Of Life Or Death! 翔VS.獅堂！魂を賭けたバトル！ Sho VS. Shido! Tamashii o kaketa BATTLE! 44. Shocking Reunion! Imperial X Appears 衝撃の再会！インペリアルX出現！ Shougeki no saikai! IMPERIAL X shutsugen! 47. The Legendary Training Grounds, Sho's Special Training! 伝説の練習場、翔の特訓！ Densetsu no renshoujou, Sho no tokkun! ^ "韋駄天翔ドットコム". www.idatenjump.com (in Japanese). Retrieved February 22, 2019. ^ "韋駄天翔" (in Japanese). Aniplex. Retrieved February 22, 2019. ^ "韋駄天翔" (in Japanese). Production I.G. Retrieved February 22, 2019. ^ "テレビ東京・あにてれ　韋駄天翔（イダテンジャンプ）" (in Japanese). TV Tokyo. Retrieved February 22, 2019. ^ "TV東京・あにてれ 韋駄天翔(ジャンプ)" (in Japanese). TV Tokyo. Retrieved February 22, 2019. Sakura Wars 3: Is Paris Burning? This page was last edited on 16 April 2019, at 03:45 (UTC).